On the Chicago Mercantile milk futures closed early for the week supported by strong exports. April and May milk both closed unchanged despite May trading 18 cents higher at its peak. June through December 2019 added 4-8 cents. May is offering producers $15.69 per cwt. June ended at $15.95, while the second half of the year settled with at $16.48 average. 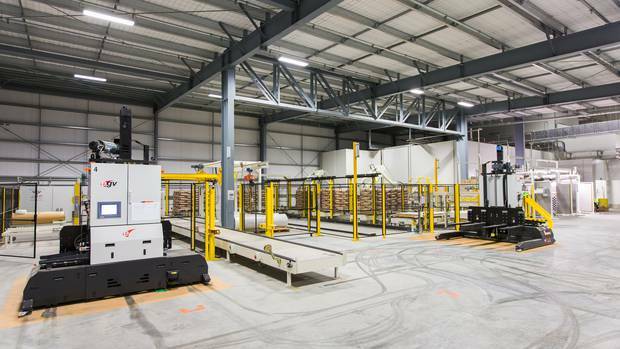 The first quarter of 2019 also rose 3-5 cents per cwt. to a $16.08 average. Class IV markets were slightly higher as well. June through December added 1-6 cents per cwt. May settled at $16.25, June at $16.61, and the second half of the year closed with its average at $17.00 per cwt. Dry whey down $0.0025 at $0.34. Seven trades were made ranging from $0.34 to $0.3450. Blocks down $0.0050 at $1.6675. Two trades were made at $1.6675 and $1.6725. Barrels down $0.0750 at $1.5150. Three trades were made ranging from $1.5150 to $1.5350. Butter up $0.0025 at $2.2825. Six trades were made ranging from $2.28 to $2.2825. Nonfat dry milk up $0.0050 at $1.00. Three trades were made at that price. The average price was up 0.5 percent to $US3447 a tonne, the 10th consecutive price gain which followed a nearly 1 percent rise in the previous auction. Volumes fell nearly 9.5 percent on the last auction. Dairy prices have been rising since late November when they hit a two-year low because of an oversupply on world markets. The price for whole milk powder, which has a key influence on farmer payouts, fell by 0.7 percent to $US3269 a tonne. Prices for butter, anhydrous milk fat and cheddar rose, while lactose fell. On the Chicago Mercantile milk futures ended Wednesday mostly higher while European dairy prices were up on the week. Class 3 markets also showed positive results during the session trading anywhere from 9 to 16 cents higher. the front months traded at 15.95 in April, 15.77 in may and 15.95 in June. The second quarter average is now at 15.89. The second half average is now at. 16.49. The 2020 Class 3 markets also saw upward movement trading anywhere from 4 to 18 cents higher in months January through September. Class 4 market moved higher as well trading anywhere from 3 to 10 cents higher in months may to December. Dry whey down $0.0050 at $0.3425. Eight trades were made ranging from $0.3425 to $0.3475. Blocks up $0.0150 at $1.6725. Five trades were made ranging from $1.66 to $1.6725. Barrels down $0.0075 at $1.59. Three trades were made ranging from $1.59 to $1.5925. Butter up $0.01 at $2.28. Three trades were made ranging from $2.27 to $2.2825. Nonfat dry milk up $0.0075 at $0.9950. Cooperatives Working Together (CWT) member cooperatives accepted four offers of export assistance from CWT that helped them capture sales contracts for 253,532 pounds (115 metric tons) of Cheddar cheese, 661,387 pounds (300 metric tons) of butter, and 220,462 pounds (100 metric tons) of whole milk powder. These products are going to customers in Asia and the Middle East. The product will be delivered during the period from May through August 2019. CWT-assisted member cooperative 2019 export sales total 25.668 million pounds of American-type cheeses, 3.466 million pounds of butter (82% milkfat) and 22.397 million pounds of whole milk powder to 22 countries in six regions. These sales are equal to 478.4 million pounds of milk on a milkfat basis. Assisting CWT members through the Export Assistance program positively affects all U.S. dairy farmers and all dairy cooperatives by strengthening and maintaining the value of dairy products that directly impact their milk price. It does this by helping member cooperatives gain and maintain world market share for U.S dairy products. As a result, the program has significantly expanded the total demand for U.S. dairy products and the demand for U.S. farm milk that produces those products. The amounts of dairy products and related milk volumes reflect current contracts for delivery, not completed export volumes. CWT pays export assistance to the bidders only when export and delivery of the product is verified by required documentation. All dairy farmers and all dairy cooperatives should invest in CWT. Membership information is available on the CWT website, www.cwt.coop. On the Chicago Mercantile milk futures ended Monday mostly lower while cash markets became more active. Class III milk futures begun Monday’s trade on a higher note before reversing course lower. April milk fell 3 cents to $15.89, May lost 13 cents to $15.65 per cwt. and June declined 9 cents to $15.74. The second half of 2019 ranged from 7 cents lower in July to 5 cents higher in December. Class IV milk added 3-7 cents per cwt. May through September. 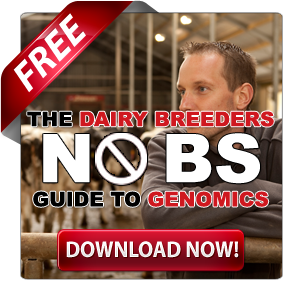 Tomorrow, Global Dairy Trade event 234 will be released. We shall see how products fare with that if milk prices can find support to further this $1.60 rally in the April contract that began mid-February. April Class III milk down three cents at $15.89. May down 13 cents at $15.65. June down nine cents at $15.74. July down seven cents at $16.05. August through December contracts were two cents lower to a nickel higher. Dry whey down $0.01 at $0.3475. Two trades were made at $0.3475 and $0.35. Blocks up $0.0050 at $1.65. Four trades were made ranging from $1.6350 to $1.65. Barrels down $0.02 at $1.5975. Four trades were made at that price. Butter remained unchanged at $2.2575. Nonfat dry milk remained unchanged at $0.9875. Grain markets on Monday saw corn add 2 cents, soybeans traded 3 and a half cents higher and wheat lost 5-7 cents per bu. Rabobank’s latest Dairy Quarterly Report will give farmers something to smile about says Emma Higgins. Rabobank’s dairy analyst told The Country’s Jamie Mackay that stalling world production combined with increased demand is a good news double. “We called it at the end of last year, we said things are going to improve”. With global supply being tight, there is less product available to export and now New Zealand’s season has joined this trend said Higgins. Another factor aiding commodity prices is an “exceptionally robust” demand from China said Higgins, although she did have a couple of warnings about this development. Higgins’ second warning was – winter is coming. “The IMF today just reforecast their numbers around economic growth. So we’ve seen that come back from 3.5 per cent to 3.3 per cent for 2019. 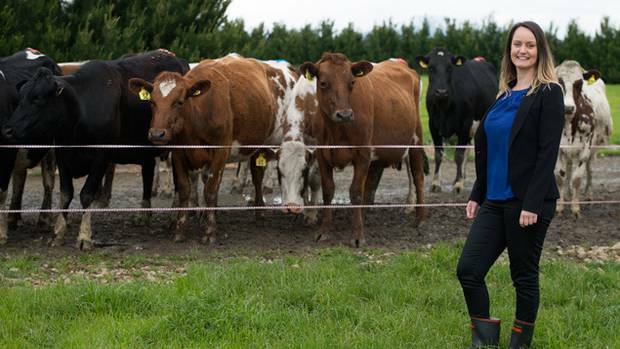 Despite the risks, Higgins said she remained hopeful for a possible $7.15 forecast Farmgate Milk Price for the 2019/20 season. On the Chicago Mercantile Exchange Milk futures closed lower Thursday backing away from gains made earlier in the week. Class III Markets fell on Thursday trading anywhere from 5 to 14 cents lower. April fell 6 cents to $15.91, May lost 14 cents to $15.78 and June fell 13 cents to $15.83. 2020 Class III milk also saw losses in months January through April trading 1 to 3 cents lower. Class IV markets fell 2 to 5 cents in the front months with most contracts unchanged. Dry whey up $0.0025 at $0.3550. Five trades were made ranging from $.03525 to $0.3550. Blocks down $0.01 at $1.6450. One trade was made at that price. Barrels unchanged at $1.5950. Three trades were made ranging from $1.5950 to $1.5975. Butter remained unchanged at $2.2575. Nonfat dry milk remained unchanged at $0.9875. On the Chicago Mercantile Exchange milk futures inched higher Wednesday while cash markets sat mostly on the sidelines. Class III milk saw positive moves across 2019 months, April gained 2 cents to $15.97. May gained 7 cents to hit 15.925/cwt and the second half of the year averaged $16.43/cwt. These followed a terribly quiet day in the CME Spot Dairy Product trade. Weekly EU prices were higher for butter and whole milk powder and lower for whey powder and cheese. Dry whey remained unchanged at $0.3525. Blocks unchanged at $1.6550. Barrels up $0.0025 at $1.5950. Butter unchanged at $2.2575. Nonfat dry milk remained unchanged at $0.9875. On the Chicago Mercantile milk futures closed mostly higher Tuesday after USDA raised the all milk price forecast for the year. Class 3 markets were mixed trading anywhere from a loss of 3 cents to a gain of 13. April rose 9 cents to 15.95. may was up 13 cents to 15.85 and June rose 12 cents to 15.93. The remainder of the 1st half average is now at 15.91. The second half is now offering an average of 16.40. Class 4 milk was unchanged in April at 15.92 and lost 3 to 14 cents from May to August. Dry whey unchanged at $0.3525. Four trades were made on a range of $0.35 to $0.3525. Blocks up $0.01 at $1.6550. Seven trades were made ranging from $1.6359 to $1.6550. Barrels up $0.0150 at $1.5925. Six trades were made ranging from $1.5775 to $1.5925. Butter down $0.0125 at $2.2575. One trade was made at that price. Nonfat dry milk remained unchanged at $0.9875. Nine trades were made ranging from $0.9875 to $0.9950. On the Chicago Mercantile milk futures started the week mostly lower while cash markets were mixed. Class III milk markets were slightly lower Monday. April gained a penny to $15.86 per cwt while May through December fell 1 to 6 cents. The second quarter 2019 average now stands at $15.79 and the second half is offering $16.39 per cwt. Class IV milk saw little to no change. Dry whey up $0.0075 at $0.3525. Six trades were made on a range of $0.3475 to $0.3525. Blocks down $0.0150 at $1.6450. One trade was made at that price. Barrels up $0.0025 at $1.5775. Ten trades were made at that price. Butter unchanged at at $2.27. Nonfat dry milk remained unchanged at $0.9875. Two trades were made at $0.9875 and $0.99. Grain markets were mainly lower ahead of Tuesday’s USDA supply and demand report. Corn prices dropped 2 1/2 cents at $3.60 per bushel. Beans weakened 1/2 cents at $9.32 1/4 on new crop while bean meal added $1 per ton. Wheat fell 2 1/2 in Chicago, added a penny in Kansas City and was mixed in Minneapolis. On the Chicago Mercantile Exchange milk futures closed mixed Thursday following the direction of the cash market. Class 3 markets were mixed trading anywhere from 4 cents higher to 2 cents lower. The beginning of the session started off strong but after the spot trade, the market tapered off. April finished up 1 cent to 15.81, may finished up 4 to 15.71 and June finished up 3 to 15.83. the 2ndquarter average is 15.78 and the 2ndhalf average is 16.36. Class 4 markets were mixed as well trading anywhere from 3 cents lower to 3 cents higher in the months of may through October. Dry whey down $0.0025 at $0.3425. Five trades were made ranging from $0.3425 to $0.3450. Blocks unchanged at $1.66. One trade was made at that price. Barrels unchanged at $1.57. Seven trades were made ranging from $1.5675 to $1.57. Butter up $0.0025 at $2.2550. Three trades were made ranging from $2.2450 to $2.26. Nonfat dry milk up $0.0125 at $0.9875. Two trades were made at $0.9850 and $0.9875. The positive run for international dairy commodity prices has continued with a ninth consecutive rise. Overall commodity prices rose slightly at the latest Global Dairy Trade (GDT) event on April 2. Prices were up 0.8 percent, reaching an average price of US$3,483/t. Average prices lifted for all commodities except Whole Milk Powder (SMP) and Lactose. Federated Farmers Dairy spokesperson Chris Lewis told Rural Today’s Dominic George that the modest rise was very welcome. “That is a very good run, and starting to hit the sweet spot, and looking promising for next season,” he said. He was hoping it would translate to a rise in forecast payouts from dairy companies. Lewis said the result illustrated the on-going demand for dairy products. While most commodities had price rises, whole milk powder (WMP) average prices eased on the previous event to US$3,287/t, with the price index down 1.3 percent. NZX dairy analyst, Robert Gibson said a drop in consumer demand was behind the drop. “The decline in overall prices reflects weaker demand across our markets, particularly North Asia, and follows eight consecutive increases in average prices since December 2018,” he said. He said milk fats lifted on the previous event. The price index lifted across all contract periods for both commodities. On the Chicago Mercantile Exchange milk futures closed lower at midweek ahead of a slightly bullish dairy products report as traders bought back oversold positions. Class III milk nearby rose early, and fell after the products trade. To finish the day down 5 cent in April to $15.80 and down 3 cents in May to $15.67. Class IV fell in the nearby months and gained 2-10 cents during the second half. May Class IV ended at $16.11 and June at 16.41. Dry whey up $0.0125 at $0.3450. Four trades were made ranging from $0.3350 to $0.3450. Blocks up $0.01 at $1.66. Three trades were made ranging from $1.6475 to $1.66. Barrels down $0.02 at $1.57. Seven trades were made ranging from $1.57 to $1.5750. Butter up $0.0025 at $2.2525. Nonfat dry milk unchanged at $0.9750. On the Chicago Mercantile Exchange Milk futures showed solid strength Tuesday supported by improving global markets at the Global Dairy Trade event 233 and strong cash trade. Class 3 markets traded anywhere from 3 to 20 cents higher on Tuesday. March expired at the end of Tuesday’s session at 15.06. April settled at 15.85 and may finished at 15.70. Class 4 markets traded higher as well. March expired at 15.76 and months April through December traded 2 to 12 cents higher. Dry whey up $0.0025 at $0.3325. Five trades were made ranging from $0.3325 to $0.3350. Blocks up $0.01 at $1.65. Two trades were made at $1.6325 and $1.65. Barrels unchanged at $1.59. Seven trades were made at that price. Butter unchanged at $2.25. Nonfat dry milk up $0.0150 at $0.9750. Milk futures on the Chicago Mercantile Exchange started the week in positive territory. Class three markets seemed unmoved by the transactions. In the end, Class III prices were up single digits through the course of 2019 with the second quarter average now at $15.65 per cwt. up six cents from Friday while the third quarter was $16.29 at the end up three cents over Friday with fourth quarter averages now at $16.36. A penny better than the previous finish, Class IV markets saw similar action. The average price in the second half of the year is up a nickel to $16.74. April Class III milk up four cents at $15.65. May four cents higher at $15.52. June up a nickel at $15.72. July two cents higher at $16.06. August through December contracts were unchanged to three cents higher. Dry whey up $0.0075 at $0.33. Six trades were made ranging from $0.3250 to $0.33. Blocks down $0.0050 at $1.64. Four trades were made ranging from $1.6250 to $1.6350. Barrels down $0.0125 at $1.59. Four trades were made ranging from $1.59 to $1.60. Butter down $0.0050 at $2.25. One trade was made at that price. Nonfat dry milk down $0.0025 at $0.96. One trade was made at $0.9575. On the Chicago Mercantile Exchange milk futures were mostly higher Wednesday as long-term outlooks for dairy remain positive. June – December Class III milk showed some slight gains on the day. Up 2-4 cents, the second half average came in at $16.30/ cwt. Nearby months didn’t hold the upward momentum we saw over the last few trading sessions. March finished off 2 cents to $15.06 and April was off 6 cents to finish Thursday at $15.63. Class IV milk saw April finish down 2 cents to $15.85/cwt and May 3 cents higher to $16.11. Dry whey unchanged at $0.32. Six trades were made ranging from $0.3175 to $0.32. Blocks down $0.0125 at $1.7175. Barrels unchanged at $1.5925. Butter down $0.0050 at $2.26. Nonfat dry milk down $0.0025 at $0.96. Two trades were made at $0.9575 and $0.96. On the Chicago Mercantile Exchange milk futures were higher Wednesday supported by continued support in the cash cheese market while weekly European dairy prices were mixed. Class 3 markets were slightly higher seeing gains of 1 to 7 cents. March settled up 2 cents to 15.08, April finished up 7 cents to 15.69 and may finished up 3 cents to 15.48. Months June through October were left unchanged to 5 cents higher. U.S. dairy exports during January were mixed from last year and December. Whole milk powder had the highest increase from last year, up more than 182 percent. Dry whey down $0.0025 at $0.32. One trade was made at that price. Blocks up $0.04 at $1.73. One trade was made at that price. Barrels up $0.0050 at $1.5925. Six trades were made ranging from $1.5875 to $1.5925. Butter down $0.01 at $2.2650. Nonfat dry milk unchanged at $0.9625. On the Chicago Mercantile Exchange Milk futures were higher Tuesday. March settled 1 cent to 15.06, April finished up 13 cents at 15.62 and may finished up 7 cents to 15.45. months June through December traded 1 to 3 cents higher. The rest of the 1sthalf average is now at 15.43 and the second half average is at 16.26. Class 4 markets were also positive on Tuesday trading anywhere from 5 to 10 cents higher. Dry whey down $0.0050 at $0.3225. Five trades were made ranging from $0.3225 to $0.3275. Blocks up $0.05 at $1.69. Barrels up $0.0175 at $1.5875. Ten trades were made ranging from $1.5675 to $1.59. Butter down $0.0050 at $2.2750. 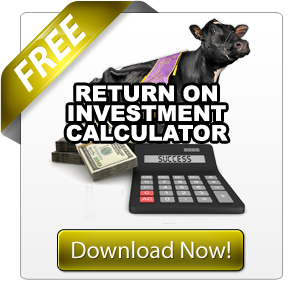 Nonfat dry milk up $0.0075 at $0.9625. Three trades were made ranging from $0.96 to $0.9625. On the Chicago Mercantile Exchange milk futures started the week mixed following the direction of the cash market. We saw April Class III milk rally as much as 30 cents during cheese trading, to settle at 20 cents higher to $15.49. The remainder of the months didn’t do as well. March was up 2 cents to $15.05 and second half saw mixed moves from 1 cent lower to 5 cents higher for an average of 16.22/cwt. Class IV milk was also mixed from 7 cents lower in August to 9 cents higher in June. April Class IV ended the day at 15.84/cwt and May at $15.96. Dry whey down $0.0025 at $0.3275. Eight trades were made ranging from $0.3275 to $0.33. Blocks up $0.07 at $1.64. Barrels up $0.0050 at $1.57. Fifteen trades were made ranging from $1.5650 to $1.57. Butter up $0.0150 at $2.28. One trade was made at that price. Nonfat dry milk down $0.0025 at $0.9550. Two trades were made at $0.9450 to $0.9525. On the Chicago Mercantile Exchange Thursday, Milk futures, cheese, and whey prices were up. March added 9 cents to its price and closed at $15.03 per cwt. April-July fared the best, jumping 11-23 cents. The 2ndquarter of 2019 is offering producers $15.50 cents per cwt, the highest we have seen in that period of time since mid-January. August through December prices increased 2-5 cents and the 2ndhalf settled at a price of $16.29 per cwt. Class IV markets ranged from 2 cents lower to 3 cents higher. Dry whey was up $.0125 at $.3225 cents per pound. Six sales were recorded from $.31 to $.3225. Forty-pound blocks were unchanged at $1.5825 per pound. No sales were recorded. Barrels were up $.02 at $1.5650 per pound. Eleven sales were recorded from $1.5450 to $1.5650. Grade AA Butter was unchanged at $2.2850 per pound. No sales were recorded. Nonfat dry milk was unchanged at $.9575 per pound. No sales were recorded. Dairy prices have risen again, for the eighth consecutive time. At the latest global auction overnight, the average price was up by 1.9 percent to $US3324 ($NZ4846) a tonne. Prices have steadily climbed since late November, when they hit a two-year low because of market oversupply. The price of whole milk powder – a key influence on farmer payouts – increased by 4 percent to $US3017 ($NZ4398) a tonne. Prices for most products rose. On the Chicago Mercantile Exchange milk futures ended higher again midweek while cash dairy trade slowed. Class 3 markets saw a positive move after barrels moving higher in the spot trade this morning. Class 3 traded anywhere from 1 to 16 cents higher. March finished up 1 cent to 14.94, April was up 12 cents to 15.10, and May was up 16 cents to 15.31. The remainder of the 1st half average is at 15.23 and the second half average is at 16.24. Class 4 markets moved slightly lower but only traded in April through July losing anywhere from 1 to 8 cents. Dry whey up $0.0050 at $0.31. Seven trades were made ranging from $0.3050 to $0.31. Blocks unchanged at $1.5825. Two trades were made at $1.57 and $1.58. Barrels up $0.0350 at $1.5450. Nine trades were made ranging from $1.52 to $1.5450. Butter unchanged at $2.28. Nonfat dry milk down $0.0050 at $0.9575. Five trades were made ranging from $0.9525 to $0.96. On the Chicago Mercantile Exchange milk futures closed higher on Tuesday supported by a slightly bullish Global Dairy Trade report. The Global Dairy Trade auction index in New Zealand continued higher for the eighth straight session. The index increased 1.9 percent from the last event at $3,324 per ton. Rennet casein was up nearly 10 percent and butter was up more than nine percent. Anhydrous milk fat was down more than three percent and skim milk powder was down 2.4 percent. Strength in the Class III price was driven by the cheese market. March Class III milk up a penny at $14.93. April up 23 cents at $14.98. May 12 cents higher at $15.17. June up 10 cents at $15.48. July through November contracts were unchanged to nine cents higher. Dry whey up $0.0050 at $0.3050. Five trades were made ranging from $0.3025 to $0.3075. Blocks up $0.0225 at $1.5825. Two trades were made at $1.5825 and $1.59. Barrels up $0.0175 at $1.51. Ten trades were made ranging from $1.4925 to $1.51. Butter down $0.0050 at $2.28. One trade was made at that price. Nonfat dry milk down $0.0050 at $0.9625. Seven trades were made ranging from $0.9550 to $0.9625. On the Chicago Mercantile Exchange Monday milk futures were down and cash dairy prices were unchanged except for butter, following Friday’s selloff of 20 cents per cwt. March lost 2 cents per cwt. to $14.92 while April fell another 13 cents to $14.75 per cwt. Beyond April, milk prices declined 2-8 cents per cwt. The March-June average now stands at $15.02. The 2ndhalf is offering $16.15 per cwt. Class IV markets had little change with May 5 cents stronger, September 7 cents lower and November down 3 cents. The March-June 2019 average closed Monday at $15.99 while the 2ndhalf ended at $16.65 per cwt. respectively. Dry whey was down $.02 at $.30 cents per pound. Five sales were recorded at that price. Forty-pound blocks were unchanged at $1.56 per pound. No sales were recorded. Barrels were unchanged at $1.4925 per pound. No sales were recorded. Grade AA Butter was up $.0050 to $2.2850 per pound. One sale was recorded at that price. Nonfat dry milk was unchanged at $.9675 per pound. No sales were recorded. Dry weather throughout much of the country has driven up milk futures prices to close to $7.00 a kg for next season. The NZX milk futures contract – designed to help farmers mitigate the risks associated with variable milk prices – has been steadily rising since January, when the dry weather started to set in. Fonterra has forecast milk collection to fall to 1,510 million kg of milk solids for the current season due ongoing dry weather, particularly in the North Island. The co-op’s latest forecast is slightly above last season’s collections of 1,505m kgMS – a season also impacted by poor on-farm conditions – and down from February’s forecast of 1,530m kg. The NZX’s September 2020 milk price contract last traded at $6.80/kg, up from around $6.00/kg in January. “The fear is that this dry weather is going to roll into next season,” Nigel Brunel, director of institutional commodities at OM Financial, said. 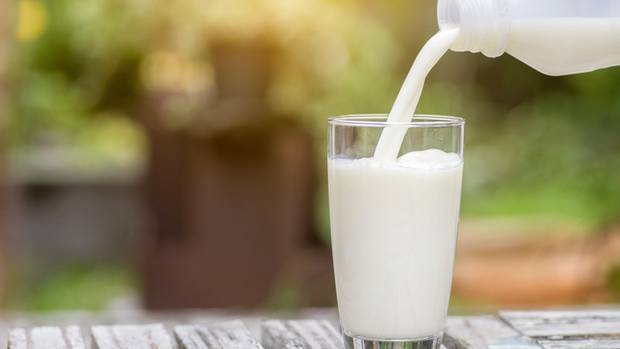 Brunel said the rally in the milk futures contract reflected the 22 per cent rise in the “grand daddy” of the New Zealand milk products – whole milk powder – since late last year. Futures market pricing pointed to another lift in prices at the next sale this Wednesday, he said. At current levels of US$3400 to US$3500 a tonne, whole milk powder production was starting to look attractive for competing dairy producers abroad, he said. Weather agency NIWA, in its weekly report, said the North Island, from Wellington-Wairarapa to the lower Waikato, soil moisture levels had increased over the past week due to beneficial rainfall. In the north and east of the North Island, soil moisture levels had generally remained the same. NIWA said the driest soils for the time of year were across the northern Waikato and in the Bay of Plenty. The wettest soils for this time of year are located in Gisborne, central Hawke’s Bay, and Wellington-Wairarapa. In the South Island, soil moisture levels were similar to this time last week. The driest soils for the time of year are across the Buller and Tasman District as well as Nelson, where the Ministry for Primary Industries recently classified the combination of impacts of fire and drought as a medium-scale adverse event. The wettest soils for the time of year are now located in northeast Marlborough, it said. The U.S. Department of Agriculture announced the February Federal Order Class III benchmark milk price Feb. 27 at $13.89 per hundredweight, down 7 cents from January. However, that is 49 cents above February 2018 and, indicating the current down market, the first month that the Class III price topped the previous year’s price since November 2017. It equates to $1.19 per gallon, compared to $1.20 in January and $1.15 a year ago. The Class IV price is $15.86, up 38 cents from January, $2.99 above a year ago and the highest Class IV price since August 2017. Reports abound throughout the country of dairy farms leaving the business due to financial issues. Farm margins were relatively flat in the first half of February, with values still projected below break-even over the first half of the year, according to the latest Margin Watch from Chicago-based Commodity & Ingredient Hedging LLC. Cheese traders took the cheddar blocks higher for the fifth week in a row, closing March 1 at $1.61 per pound, up 1.5 cents on the week. That’s the highest level since October 2018, and 5 cents above a year ago. The barrels finished at $1.41, up a half-cent on the week, 6.5 cents below a year ago and 20 cents below the blocks. Cheese demand reports vary, according to Dairy Market News, although a growing segment of Midwestern cheesemakers report a seasonal shift slower. Cheese inventory is unchanged, but long. Milk is readily available in the West and vats are at or near capacity. Inventories are still heavy and manufacturers want to keep stocks in check as the spring flush nears. Butter closed March 1 at $2.2875 per pound, up 2.75 cents on the week, the highest since Feb. 1, 2019, and 8.75 cents above a year ago. Central butter plant managers continue reporting widely available cream for the churns, as milk production marches on. But demand is picking up ahead of the spring holidays. Inventories are plentiful. Western churning continues at a full and fast pace, so some processors have stopped buying cream as they do not have enough capacity. Butter supplies are also plentiful and stocks continue to increase. Grade A nonfat dry milk saw a close at 98.5 cents per pound, down 1.25 cents on the week but 32.25 cents above a year ago. Dry whey saw some ups and downs, but finished at 36 cents per pound, 1.25 cents higher on the week. 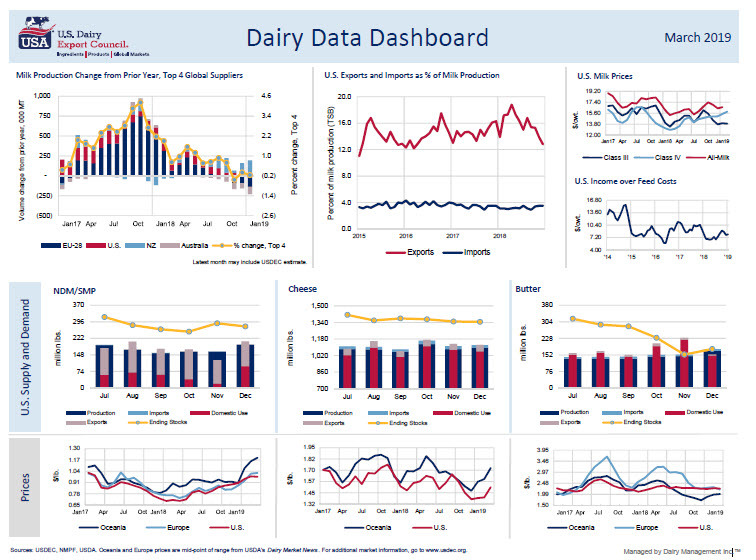 Every month, USDEC aggregates dairy data to display 10 charts on a one-page dashboard. 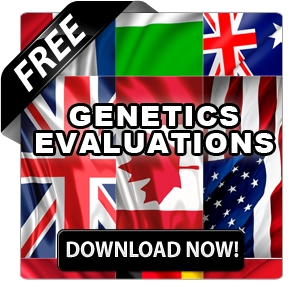 Click here or on the image below to get a printable PDF file. 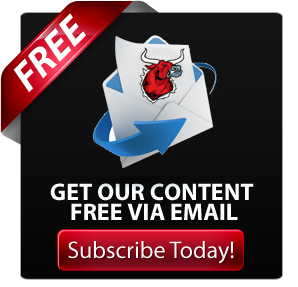 Get email alerts when a new dashboard is published by subscribing to the U.S. Dairy Exporter Blog here. Click here to get a printable PDF of the Dashboard. On the Chicago Mercantile Exchange Milk futures closed higher Thursday ahead of a neutral to bearish dairy product production report. Class III milk gained in most months. April was up 14 cents to push back above that $15 mark and finish the day at $15.09. March was up 4 to finish at $14.95/cwt. May 14 cents higher at $15.33. June up 13 cents at $15.64. July through November contracts were three to 11 cents higher. Thursday’s market had an upward trend driven by the strength in Cheddar blocks and Barrels. Dry whey down $0.01 at $0.3225. Seven trades were made ranging from $0.3225 to $0.33. Blocks up $0.03 at $1.56. Three trades were made ranging from $1.54 to $1.56. Barrels up $0.0625 at $1.4875. Five trades were made ranging from $1.42.50 to $1.4850. Butter up $0.0050 at $2.2850. Three trades were made ranging from $2.28 to $2.2850. Nonfat dry milk down $0.0025 at $0.9625. One trade was made at that price. USDA released the January Dairy Products report Thursday. Most notable was the 190 million lbs of Butter produced. This is up 4.2% from January 2018 and is 10.4% above December 2018’s large production. Total cheese in January hit 1.1 billion pounds. Up 4/10 of a per cent above January 2018 productions and 7/10 above December’s production. NonFat Dry Milk was up 7.7 % from last year, however, Skim milk powder production fell 33.5% from January 2018. Dry Whey production was down 10.1 % from a year ago at 81.2 million pounds. Lactose was up 10.9% from January 2018 production. On the Chicago Mercantile Exchange Wednesday Class III milk futures were mixed, with the most active months modestly lower, trading anywhere from 6 cents to lower to 2 cents higher. March finished 1 cent lower to 14.91, April lost 3 cents to 14.95, and may fell 6 cents to 15.19. The remainder of the months were mixed to unchanged. The remainder of the first half average is now at 15.14, and the second half average is at 16.26. Class 4 markets were mainly lower to unchanged trading anywhere from 1 to 5 cents lower. The CME Spot product trade was mainly higher, as 4 of the 5 products traded. Butter was the only product unchanged at $2.28. Blocks rose 1 cent after 5 trades to $1.53 cents/lb. Barrels traded 11 times and finished up 2 ¼ cents to $1.42 1/2 cents/lb. Barrels have been trying to hold the 140-145 range since the middle of February. Grade A non fat dry milk rose ¼ of a cent to 96 ½ cents. And lastly dry whey was the only product down during the session, finishing at 33 ¼ down ¾ of a cent. On the Chicago Mercantile Exchange milk futures closed higher Tuesday ahead of a bearish milk production report. The USDA reports that the US saw an increase of 2000 cows since December, though a total of 83,000 cows left the herd in 2018. These numbers, however, resulted from sweeping adjustments made to every month previously reported in 2018. Milk production per cow increased 1.8% above a year ago to 1,988 lbs per cow. This gain helped drive 2018 to an overall growth of 1% in milk production over 2017 production numbers. Class III milk up 14-18 cents in the second quarter to finish with a quarter average at $15.26/cwt. Second half saw more moderate gains. Finishing the day averaging $16.27. March Class III milk down a penny at $14.92. April up 18 cents at $14.98. May 18 cents higher at $15.25. June up 14 cents at $15.55. July through November contracts were a penny to 14 cents higher. Dry whey unchanged at $0.34. Blocks unchanged at $1.52. Barrels up $0.0350 at $1.4025. One trade was made at that price. Butter up $0.0125 at $2.28. Two trades were made at $2.2775 and $2.28. Nonfat dry milk down $0.0125 at $0.9625. On the Chicago Mercantile Exchange milk futures started the week with limited activity, mostly to the higher side, while cash trade was mostly unchanged. Class III milk markets were 4 cents lower in March, even in April, and 1-4 cents higher May-December 2019. Second quarter prices are averaging $15.09 per cwt. The 2ndhalf closed at $16.22 per cwt. Class IV markets were 3-7 cents softer in the 2ndand ended at $16.06 per cwt. The 2ndhalf was all left unchanged at an average price of $16.66. Dry whey unchanged at $0.34. Two sales were made at $0.34 and $0.3425. Blocks down $0.0150 at $1.52. Seven trades were made ranging from $1.5125 to $1.52. Barrels unchanged at $1.3675. Butter up $0.01 at $2.2675. Nonfat dry milk unchanged at $0.9750. On the Chicago Mercantile Exchange milk futures closed lower Thursday ahead of USDA’s cold storage report. Blocks and Barrels held down Class III milk. March Class III milk down a dime at $15.09. April down 17 cents at $14.98. May down 12 cents at $15.14. June down 11 cents at $15.46. Second half average is still holding well. July – December is averaging $16.21/cwt. Class IV milk only traded in two months today. Off 12 cents in May and 9 cents in July. April Class IV milk was unchanged at $15.89/cwt. Dry whey unchanged at $0.35. Blocks down $0.0275 at $1.5525. One trade was made at that price. Barrels down $0.0225 at $1.4275. Eight trades were made ranging from $1.4275 to $1.45. Butter unchanged at $2.2575. Five trades were made ranging from $2.2575 to $2.2675. Nonfat dry milk unchanged at $0.9750. Four trades were made ranging from $0.9650 to $0.975. At the Chicago Mercantile Exchange Class III milk futures moved higher supported on Wednesday with a higher cheese trade while Class IV milk fell as butter declined in price. March class III milk futures up seven cents at $15.19. April 14 higher at $15.15. May milk up nine cents at $15.26. June up eight at $15.57. July through October contracts four to seven cents higher. Dairy product prices increased at the Global Dairy Trade auction, moving higher for the seventh straight time, led by a rally in whole milk powder. The GDT price index climbed 3.3 per cent from the previous auction two weeks ago. The average price was US$3,309 a tonne, compared with US$3,271 a tonne two weeks ago. Some 23,930 tonnes of product was sold, down from 25,324 tonnes two weeks ago. Whole milk powder jumped 6 per cent to US$3,186 a tonne. “Whole milk powder demand is robust at present and this is a very strong result seeing as milk continues to flow (albeit heat impacted in recent weeks) and product volumes are plentiful,” Rabobank dairy analyst Emma Higgins said in a note. At the latest GDT auction, butter milk powder—which was not offered at the previous event—soared 11 per cent to $3,480 a tonne. Cheddar jumped 6 per cent to US$3,888 a tonne, while anhydrous milk fat gained 3.9 per cent to US$5,837 a tonne. Butter rose 3.7 per cent to US$4,657 a tonne, while lactose added 0.6 per cent to US$1,009 a tonne. Meanwhile, skim milk powder dropped 4.3 per cent to US$2,462 a tonne, while rennet casein slipped 0.1 per cent to US$5,649 a tonne. For sweet whey powder, no product was offered or sold, or no price was published for the last event, or on both of the two previous events. The New Zealand dollar last traded at 68.01 US cents as of 1.52pm in New York, compared with 68.19 US cents at the previous close in Wellington. There were 109 winning bidders out of 176 participating at the 14-round auction. The number of registered bidders was 516, up from 513 at the previous auction. Falling global prices for milk powder and butter meant overall export prices dropped 1.7 percent in the December 2018 quarter, Stats NZ said today. Due to lower export prices, and rising import prices, the terms of trade fell 3.0 percent in the December quarter, the biggest fall since the September 2015 quarter. Despite the latest fall, the terms of trade remained near the historic high in the December 2017 quarter. The terms of trade measures the purchasing power of New Zealand’s exports abroad and is an indicator of the state of the overall economy. A fall in the terms of trade means the country can buy fewer imports for the same amount of exports. Overall, dairy product export prices fell 5.7 percent in the December 2018 quarter. Prices for milk powder, a key export, fell 6.2 percent; butter prices also fell from their recent high levels. Dairy product volumes fell 1.3 percent, while values fell 6.8 percent. “While the Global Dairy Trade price index has been increasing recently, there’s often a lag between an auction price and when that order is filled,” business prices delivery manager Sarah Johnson said. Import prices rose 1.4 percent in the December 2018 quarter, driven mainly by crude oil, diesel, and petrol prices; petroleum and petroleum product prices rose 7.5 percent overall. Petroleum and petroleum product volumes fell 15 percent, while values fell 8.6 percent in the latest quarter. On the Chicago Mercantile Exchange milk futures started the week mixed following the trend of the cash market. Class III milk was weaker in the nearby months. Trading down 7 cents in March to $15.13 /cwt and down 13 cents in April to finish at $15 even. Second half was mostly unchanged. July- December averaging $16.18 / cwt Class IV milk traded 5 cents higher for April finishing the day at $16.10 and May was up 6 cents to $16.30/cwt. Dry whey down $0.0075 at $0.3525. Seven trades were made ranging from $0.35 to $0.3550. Blocks down $0.04 at $1.57. Four trades were made ranging from $1.57 to $1.5725. Barrels up $0.02 at $1.43. Ten trades were made ranging from $1.41 to $1.43. Butter up $0.0525 at $2.34. Five trades were made ranging from $2.31 to $2.34. Nonfat dry milk up $0.0025 at $0.9875. Corn and soybean markets were up Monday, finally breaking free of the falling wheat market. Soybeans were up as many as 12 cents during Monday’s trade, but finished up 4 cents to 9.03 ¼ and May SBM finished up $3.10 to $310.50/ton. Corn was up 1 cent in March to 3.65 even. At the Chicago Mercantile Exchange Thursday, milk futures and cash dairy prices were mostly down. April Class III milk and butter were the only gainers. March Class Three milk was down $.07 at $15.24. April was up $.03 to $15.20. May was down $.06 to $15.26. June was down $.12 to $15.58. The milk futures from July through next February ranged from zero to ten cents lower. Dry whey was down $.0150 at $.3450 cents per pound. Fifteen sales were recorded from $.34 to $.35. Forty-pound blocks were unchanged at $1.61 per pound. No sales were recorded. Barrels were unchanged at $1.41 per pound. Ten sales were recorded at that price. Grade AA Butter was up $.0050 to $2.2650 per pound. Two sales were recorded at $2.2625 and $2.2650. Nonfat dry milk was down $.0025 to $.9875 per pound. Five sales were recorded from $.9850 to $.9875. At the Chicago Mercantile Exchange Wednesday, milk futures and cash dairy prices were mixed. Near-term milk futures were higher, but lower in the long term. At the close, March settled just 4 cents higher to $15.31 per cwt. despite being 20 cents higher earlier on. April closed 14 cents higher at $15.17 cents and May was up 5 cents. The March contract has now risen 90 cents since February 19th. Beyond May the market wasn’t buying the move higher. June through December lost 2-6 cents per cwt. March-June settled Wednesday at $15.37 cents per cwt. The second half ended at $16.30. Class IV markets had similar results. April through September ranged from 4 cents lower to 5 cents higher. October and November added 10 and 11 cents respectively and December fell 3. March-June average for Class IV closed Wednesday at $16.13 and the second half settled at $16.78 per cwt. Spot products were active in the dry whey and Grade A nonfat dry milk markets. Dry whey was up $.0125 at $.36 cents per pound. Eleven sales were recorded from $.3550 to $.36. Forty-pound blocks were unchanged at $1.61 per pound. No sales were recorded. Barrels were unchanged at $1.41 per pound. No sales were recorded. Grade AA Butter was down $.0050 to $2.26 per pound. Three sales were recorded at $2.25 and $2.26. Nonfat dry milk was up $.0050 to $.99 per pound. Ten sales were recorded from $.9825 to $.9925. At the Chicago Mercantile Exchange Tuesday milk futures were mostly higher and cash dairy prices remain mixed. Class III milk had nice gains in every month except February which fell a penny to $13.94. The remainder of 2019 had its fourth positive trading day to finish up as many as 20 cents. Jan – June average coming in at $14.86/cwt and Second half at $16.35. March Milk was once again the largest mover, finishing up 20 cents to $15.27. This continues a nearly 80 cent rally since its close on Feb 20th. Class IV milk did not fair as well, weaker trading had forward month down7-27 cents, but March traded unchanged at $15.88. Dry whey was up $.0050 at $.3475 cents per pound.Seven sales were recorded from $.3450 to $.3475. Forty-pound blocks were up $.0125 at $1.61 per pound. Two sales were recorded at $1.5975 and $1.61. Barrels were unchanged at $1.41 per pound. Eight sales were recorded at that price. Grade AA Butter was down $.0025 to $2.2650 per pound. No sales were recorded. Nonfat dry milk was down $.0025 to $.9850 per pound. Two sales were recorded at $.9850 and $.99 cents a pound. Milk futures on the Chicago Mercantile Exchange started the week higher while cash trade was mixed. The Class 3 markets started off the week moving higher for the 3rd consecutive session trading anywhere from 5 to 20 cents higher across the board with most gains in the front months. Nearing expiration, the February contract was unchanged to finish at 13.95, March gained 17 cents to 15.07 and April rose 11 cents to 14.91. Including January, the first half and second half average is now at 14.78 and 16.31. February Class III milk unchanged at $13.95. March up 17 cents at $15.07. April up 11 cents at $14.91. May up a dime at $15.18. June through October contracts were five to 10 cents higher. Class 4 markets were fairly quiet on Monday as March was the only contract traded and lost 4 cents to 15.88. The rest of the months were unchanged. Dry whey down $0.0050 at $0.3425. Seven trades were made ranging from $0.3425 to $0.3450. Blocks down $0.0025 at $1.5975. Barrels up $0.0050 at $1.41. Nine trades were made ranging from $1.4025 to $1.41. Butter up $0.0075 at $2.2675. Nonfat dry milk down $0.01 at $0.9875. Five trades were made at that price.